Reverend Donna Brown was born in Mount Vernon, New York. She is married with five children and five grandchildren. Reverend Brown has been preaching and teaching since 1997. 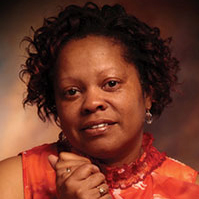 She currently serves as Assistant Pastor along the side of her husband Pastor Clinton Brown, Sr. at The First Baptist Church Bolling Brook, Norfolk, VA. Reverend Brown is the founder of MyEarth Ministries; a ministry of teaching and encouragement in the love of God and producing effective disciples. Reverend Brown attributes her life and success to God and is thankful to Him for her parents, Gene & Bertha Hill.